Please join us in calling on the DOJ to drop the charges against him so he can grieve his son’s death. Tell the DHS to grant Temporary Protected Status to Central Americans so that no one else suffers the same situation due to immigration system’s cruelty! UPDATE: Important Victory with DOJ but the Fight Continues with ICE! 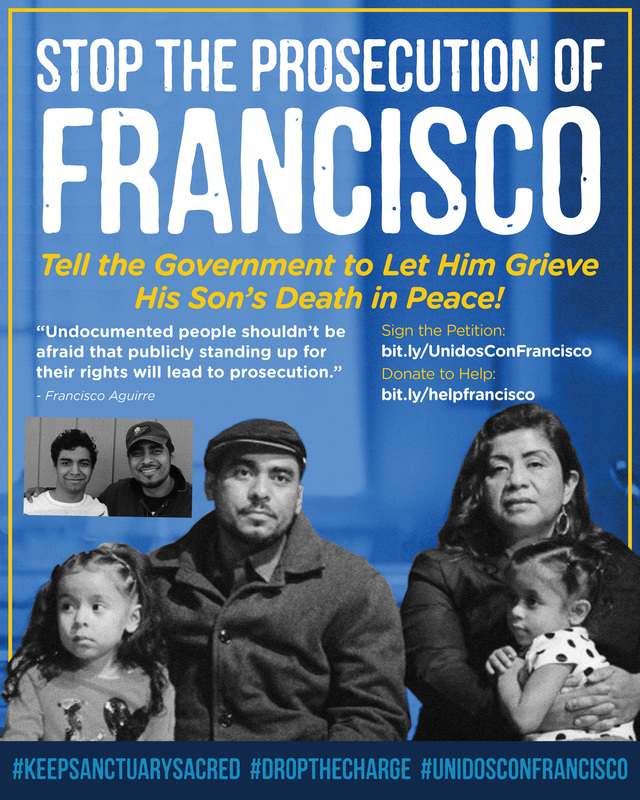 Great news, the U.S. Department of Justice (DOJ) has dropped the prosecution against Francisco! This means Franciso is no longer facing prison time and an unjust criminal reentry charge. Now, it’s up to us to double-down on our efforts and get ICE to end its harassment of Francisco Aguirre and his family. With your help, more than a hundred organizations signed support letters, thousands of individuals signed petitions, and cities around the country held rallies and vigils demanding that the charges be dropped. This is an important victory in his case and we hope that it will serve as an example for the DOJ to stop prosecuting refugees escaping violence. Less than one week later, ICE is up to its old tricks. Rather than giving Francisco the opportunity to argue his case for asylum/withholding of removal before an immigration judge, ICE served him with a “Notice of Intent to Issue a Final Administrative Removal Order” (FARO), a little-known maneuver in which an ICE agent orders a non-citizen to be deported without even the limited judicial oversight provided by immigration court. Francisco Aguirre is an influential and brilliant leader in the immigrant rights and labor movements, a refugee from El Salvador, a long-time Portland resident, a talented musician, and a devoted husband and father. He is also experiencing the horror that far too many Central American parents know: Grieving a senselessly murdered child. Cruelly, he faces years in prison for fleeing his own potential death in El Salvador. Two years ago, Immigration and Customs Enforcement (ICE) agents came to Francisco's home and tried to arrest him without a warrant and separate him from his family. Francisco then publicly sought sanctuary in the Augustana Lutheran Church in Portland, Oregon. In a deeply unusual and likely political move, the Department of Justice (DOJ) charged Francisco with re-entry fifteen years after a previous deportation to El Salvador, which he had fled due to extreme violence against him and his family by the military. Two weeks after Francisco and his family left the church, Department of Homeland Security (DHS) investigators came to their home to question and harass them about food stamps. Moises, Francisco's eldest child, hid under the bed while the investigators questioned his dad and step-mom. Afterward, Francisco tried to reassure Moises that the DHS agents weren't after him, but Moises was left traumatized by the situation. Moises kept begging to go back to El Salvador because he was scared of ending up in DHS custody. Finally, in July 2015, he flew back. On February 2, 2016, Francisco received the worst news any parent could hear: Moises had been murdered in El Salvador. Reports are that two gunmen were ordered to kill him. The investigation is ongoing but the chances of finding the perpetrators are unlikely given that people don't want to cooperate out of fear of retaliation. Moises was just 19 years old. Francisco is a pillar of his community and his son Moises often volunteered to work with him. He's been active in helping defend the rights of workers and other immigrants Portland. Yet, the DOJ's prosecution of Francisco continues. His trial is scheduled to begin April 19th, 2016. We are now launching the second phase of the campaign. 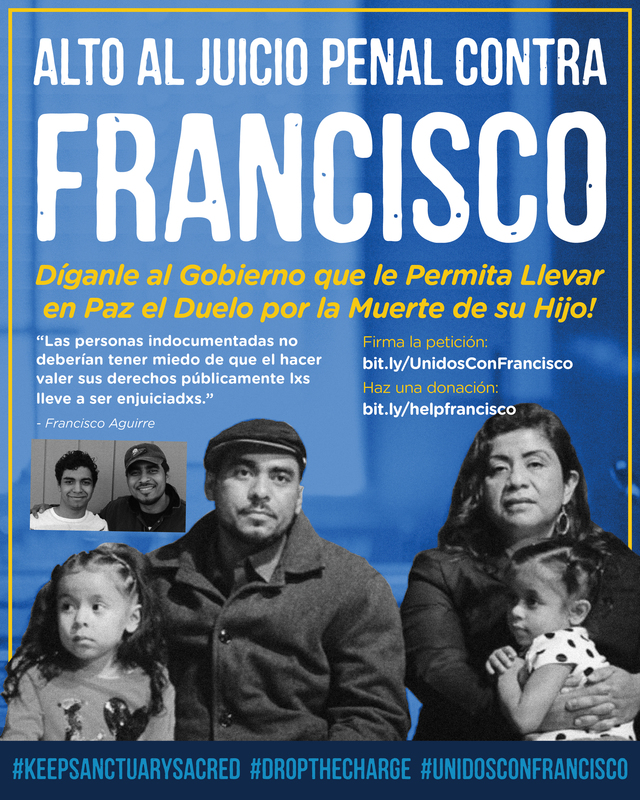 Please sign and share the petition demanding that ICE allow Francisco to present his strong refugee claims to an immigration judge and stop terrorizing this family! We are allies and community members from around the country united to stop the prosecution of Francisco Aguirre's family and to keep him together with his wife and 2 USC daughters.